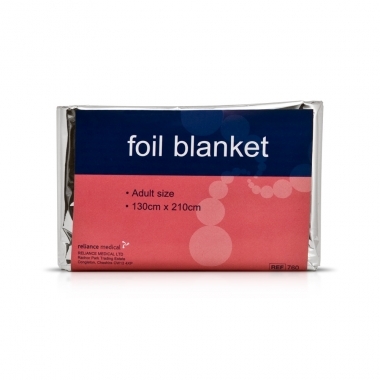 Essential protection for employees or guests who may be evacuated through fire alarm, bomb scare etc.Wherever cold weather poses a threat, the Emergency Blanket (sometimes known as 'Space Blankets') can provide essential warmth; treating and preventing the onset of Hypothermia. The inner coating reflects the vast majority of radiated body heat, warming the patient in a natural and progressive fashion. The outer layer forms an impermeable barrier to rain and wind, as well as reducing heat loss caused by evaporation. In rescue situations the blanket is also highly visible as well as being radar reflective.Hermetically sealed in polythene for hygiene and maximum shelf life (these blankets last approximately 4 years stored in dry conditions), the 'Life' Blanket weighs just 2oz (60g), and is about the size of a pack of playing cards, fitting easily into a pocket, bag, first aid kit or car glove box.When opened out the blanket measures over 7 x 5 feet (215cm x 150cm). Part of survival kit in extreme weather.